3X3 pre-gesso'd canvas, layers of transparent Golden Fluid Acrylics , wiped on, then off. 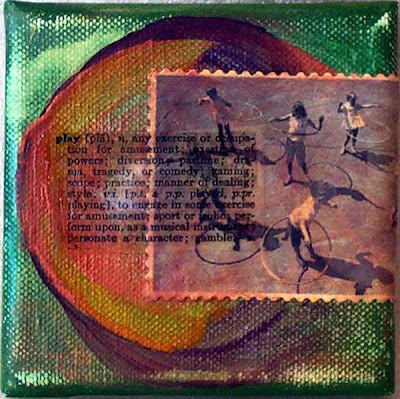 Clear transparency of text applied with gel medium and a black and white image of schoolyard hula'ing cropped with postage stamp Fiskar scissors. Don't forget to drive by my other blogspot for more fun and frivolity - "The Artful Eye"
You're every woman!! LOL Two fantastic blogs!!! This is a great canvas!